Today marks the end of Term 1, 2016. I have had many congratulations this week for surviving my first term, without any sick days as well! It had been an awesome journey thus far, I have learnt an incredible amount and feel as if I am a different person now then I was at the beginning of the term. 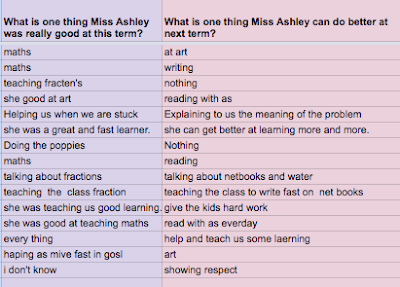 As I have been reflecting on my journey this term, I also wanted to see what my students thought about it. I thought it was interesting that they said they wanted me to read with them more, because I did at the beginning of the term and it seemed to be boring for them.. Yet they want it. So, reading from a novel everyday it is! 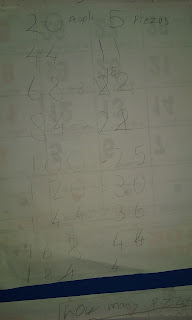 One student said 'explaining to us the meaning of the problem'. 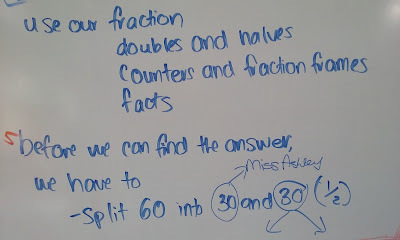 This is something I am already working on, and talked to the students about how I need to get better at this with their help (see here). But I am glad that he pointed this out so I don't forget - I'm not accountable just to myself anymore, my students want to see my progress too! I also love that one student said 'she can get better at learning more and more'. This reflects how I have encouraged a growth mindset with my learners and been open about how I am a learner in our team as well as they are! Yay for culturing a positive learning culture. Time to take a wee break before really knuckling down next term! 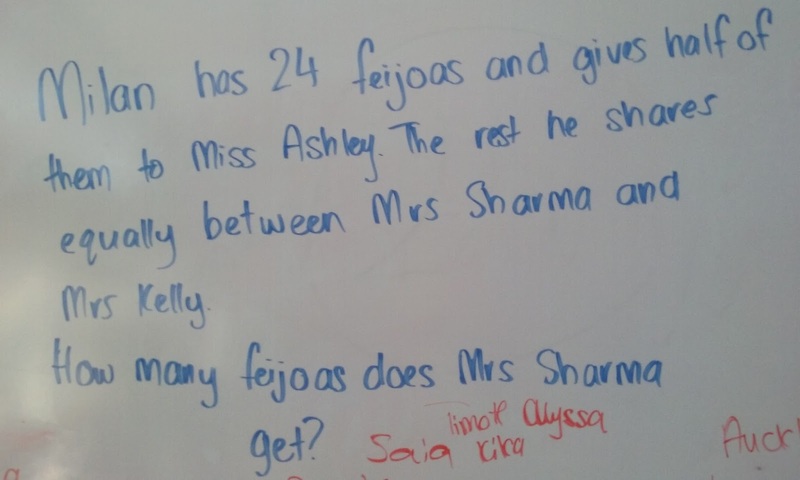 Last week I taught my class about open and closed questions, and also had my maths observation where I then immediately tried to implement some of the feedback. 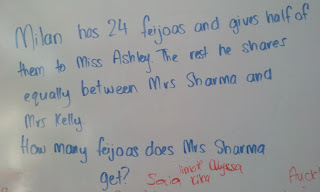 Today I combined both of those things, and gave my class an open-ended maths question. One of the pieces of feedback I was given was to move onto broader, group word problems as my class was ready and able to do them now they have begun talking about their thinking and working collaboratively with confidence. 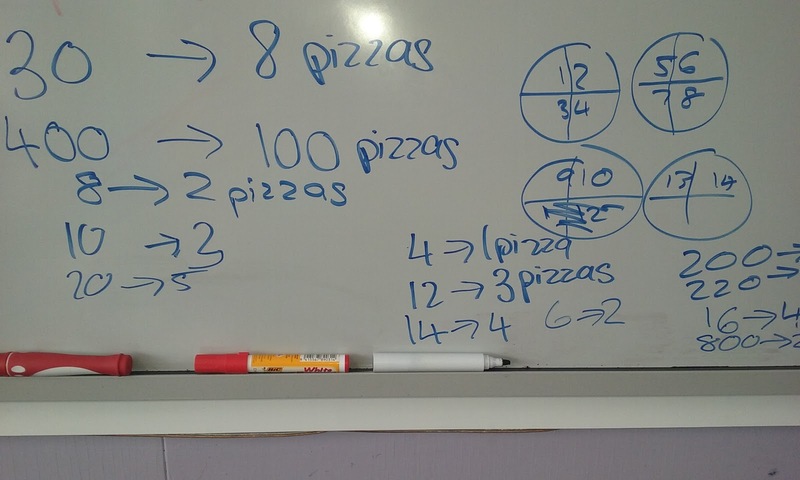 Every maths problem I have ever seen and used in maths are closed questions, where one particular answer is sought, so using an open-ended question was quite different for me and I wasn't sure how the students would respond. 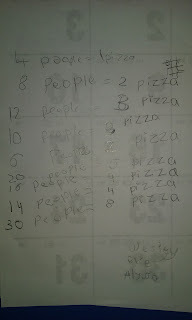 Miss Ashley wants to order pizza to share. 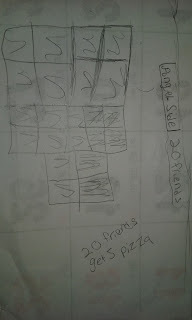 If each of her friends will eat 1/4 of a pizza, how many pizzas does she need to order? 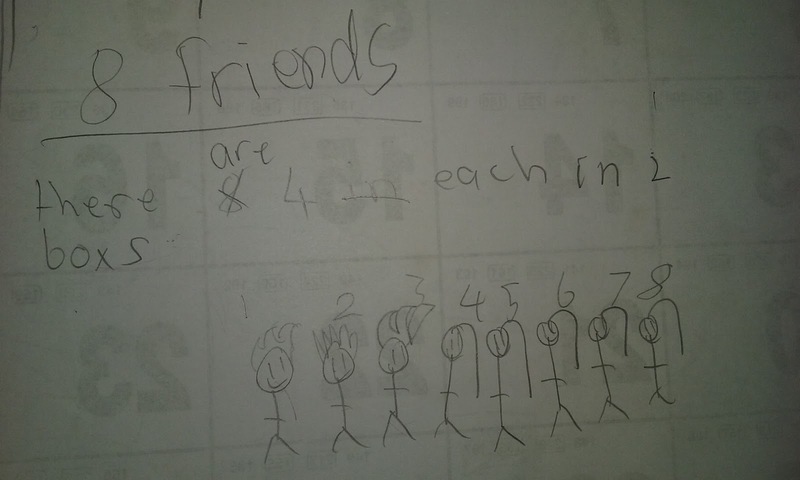 Immediately, a student asked 'Miss how many friends is there?'. 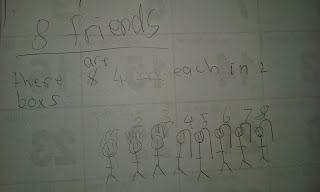 We broke down the problem (ala the other piece of feedback I have implemented) and talked about why I didn't tell them how many friends I had on purpose. 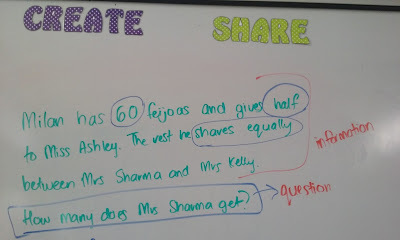 I asked them 'what kind of question is this' and they could instantly tell me it was an open question because there was more than one answer. So proud! Building on their understanding of open questions, they knew they could find more than one answer, and were eager to give it a try. 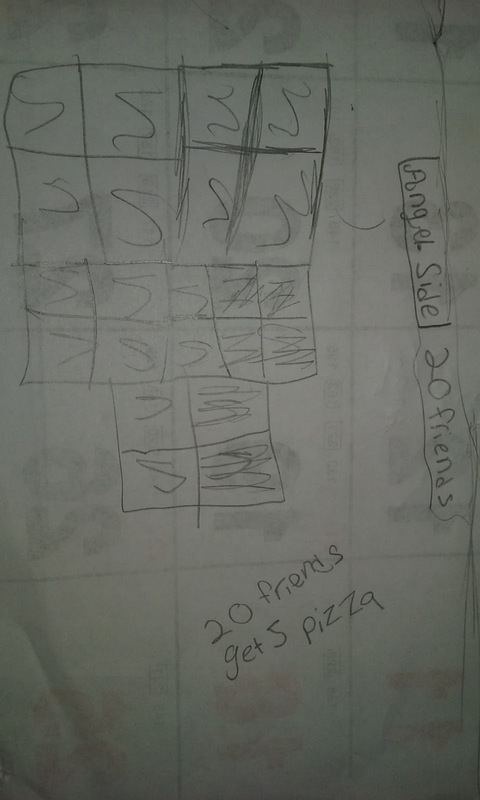 -most groups drew the pizzas or represented them by squares with four sections to show the quarters and counted out a quarter for each person until they had enough pizzas for the friends. 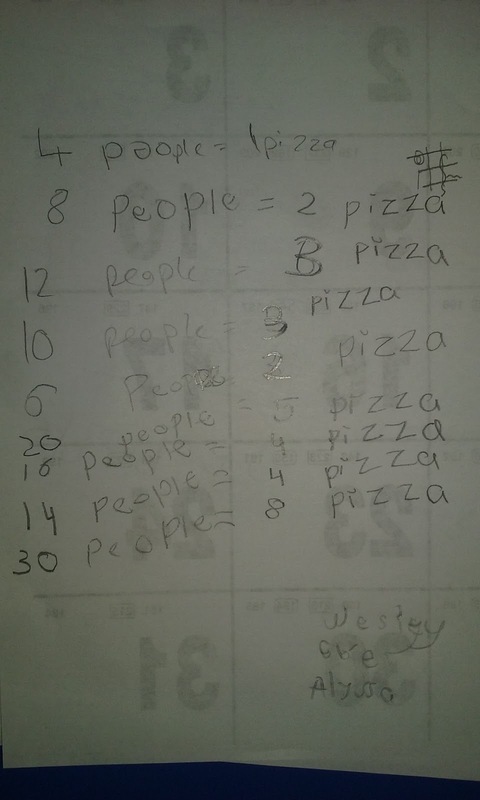 -one group drew the pizzas, labeled each quarter, then had to 'name' each piece of pizza with an initial of one of the friends to ensure they didn't miss anybody. 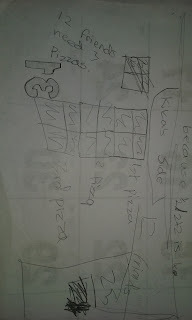 -one group didn't draw any pizzas, and used their knowledge of doubles and their 4x tables. 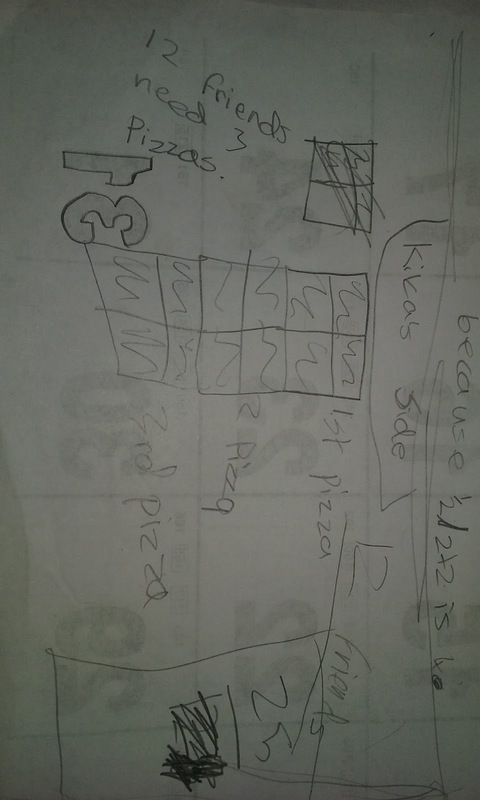 They knew that you need 4 pieces of pizza/1 whole pizza per 4 people, so they found one quarter of the number of people as their number of pizzas required. 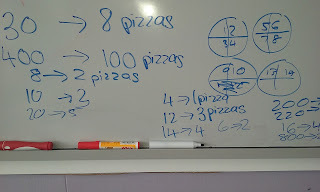 Every group shared at least one answer, and the group who used their multiplicative knowledge could explain to the rest of the class what they did as well which was awesome! I also loved how this activity cemented and demonstrated what the students have been learning about fractions for the past six weeks. 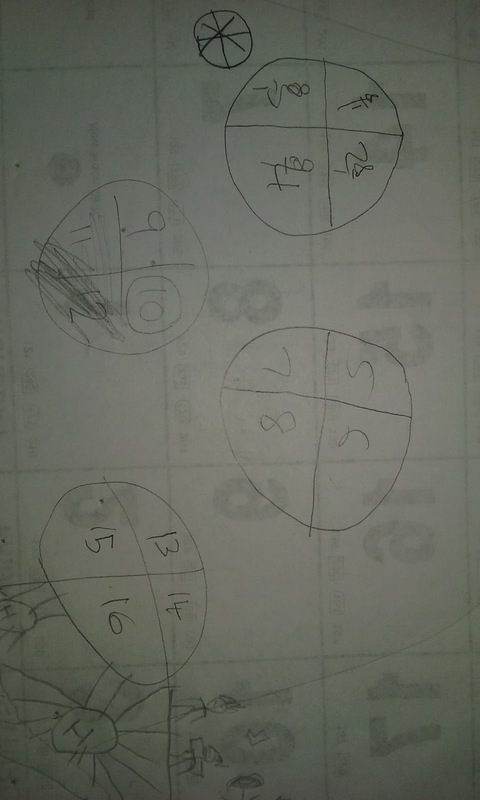 Most of them instantly knew that 1/4 means you need 4 equal groups, they knew that 4 quarters made one whole pizza, and that you could have lots of quarters that then made lots of whole numbers. 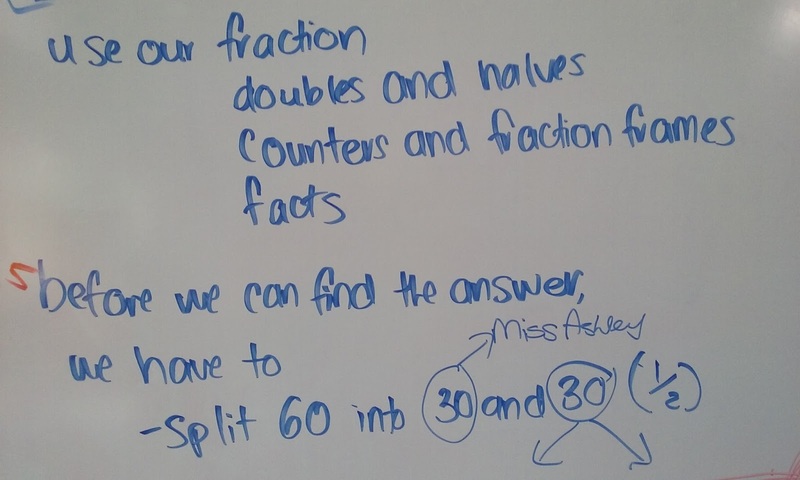 Next time I use an open-ended question, I think I will use one that does reinforce what they have been learning, but frames it in a different way so they are challenged more by it. This could even be the wording the problem uses. 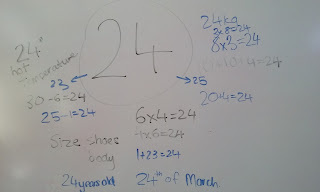 Today we began making our sites that we will use for teaching and learning in Term 2. I played around a lot with this site, trying to get things where I wanted them to sit and creating the supporting HTML for my design. Over the past two weeks we have revised a lot of the things we learnt about HTML, especially the use of tables to hold content. My Inquiry site is made entirely using HTML formatting (rather than WYSIWYG formatting) which is quite an accomplishment for me. It is very helpful to refine my skills by creating different layouts, changing/merging cells in invisible tables, set theme colours, fonts and styles to override the automatic formatting. Not to say I am an expert, certainly not. 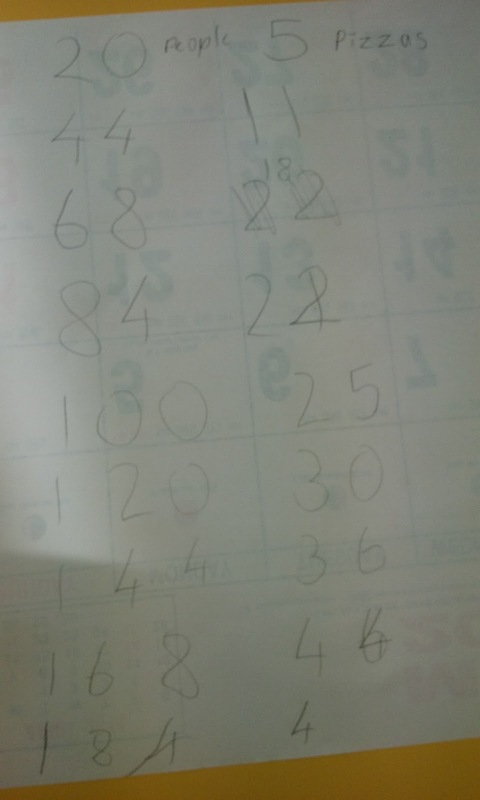 This page I literally scraped and started again, four or five times. 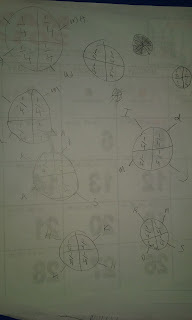 It was difficult to get the page to do what I had in my head (diagonally downwards, L to R) using HTML. 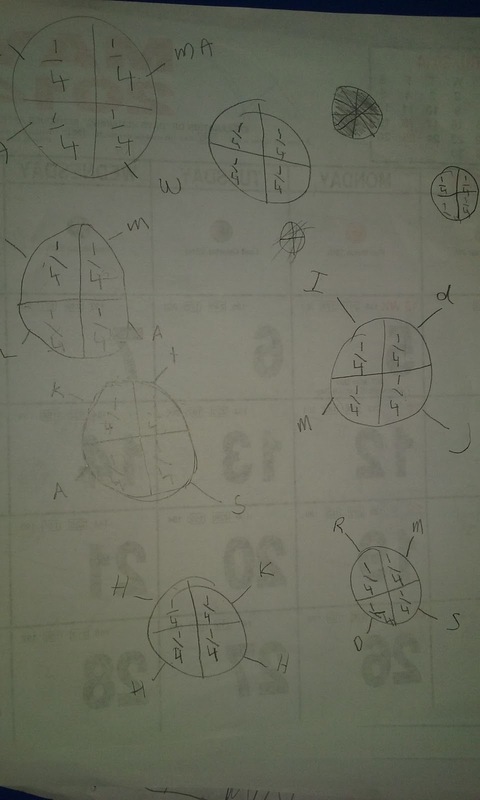 In the end, I discovered the best way to do it was to have invisible cells either side of each piece of content, and change the width of those cells to make each one sit either hard left, center, or hard right accordingly. I got there in the end, but no small feat! I'd love to see what you think of this site. The perfect metaphor for teaching! Today I heard the perfect metaphor for teaching and just had to share it. 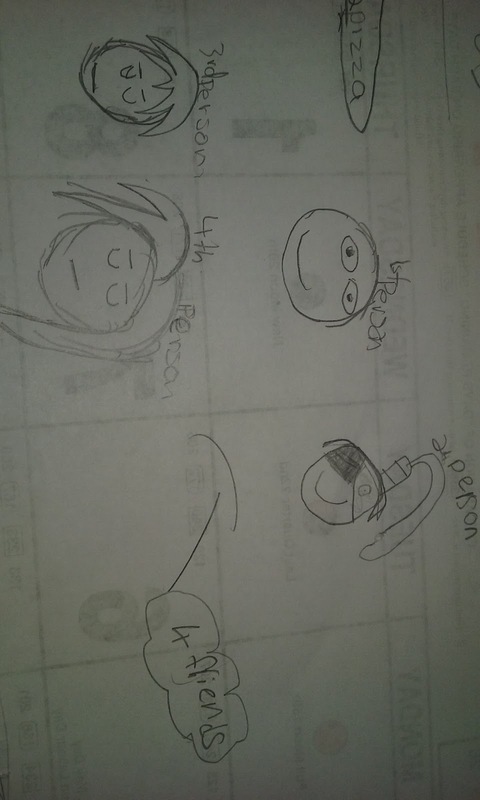 Rebecca, one of my uni lectures told us that teaching is like riding a mountain bike. Below, I explain in my own words. When things are going great, you feel like you are flying. When they are not, all you can do is hold onto the handle bars, try to stay upright and hope for the best outcome. When you are scared, in the pit, or taking a huge risk, all you can do is take a deep breathe, roll over the edge of the mountain, and hold on tight. 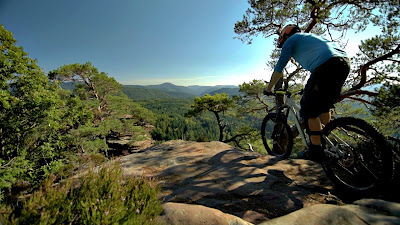 When you are obsessing about trying to get everything piece of data in, assessment marked, blog commented, it is like you are too busy fiddling with the gears that you forget to pedal. New teachers tend to look straight down, at the wheel in front of them. They are worried about what they are doing now. The hurdles, the bumps, the nooks and crannies we can fall into. It is almost like we are just trying to avoid things that will knock us down. New teachers are just trying to keep peddling the bike. Experienced teachers look up towards the horizon, confident they can keep peddling. And both of those are okay. Even as a new teacher, sometimes I will feel confident enough to quickly glance up and check what is on the horizon. Other times, I will be so busy taking deep breathes and holding on tight and trying not to fall off my bike, that I won't have the energy to look up. And that's okay. That is part of riding the bike. I knew I was proud of how far I have come, so having somebody observe me and give me next steps was a nerve wracking next step for me. Today in our digital immersion, we collaborated on a current events site, that when it is finished, will be gifted to the teachers of Manaiakalani for them to use, and to use a template as well. 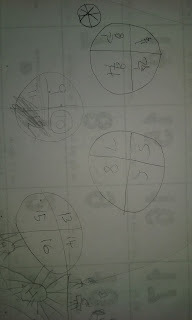 As you can see, each section is a different current event, designed around a different group of learners/learning age. This is my page - be sure to scroll down! 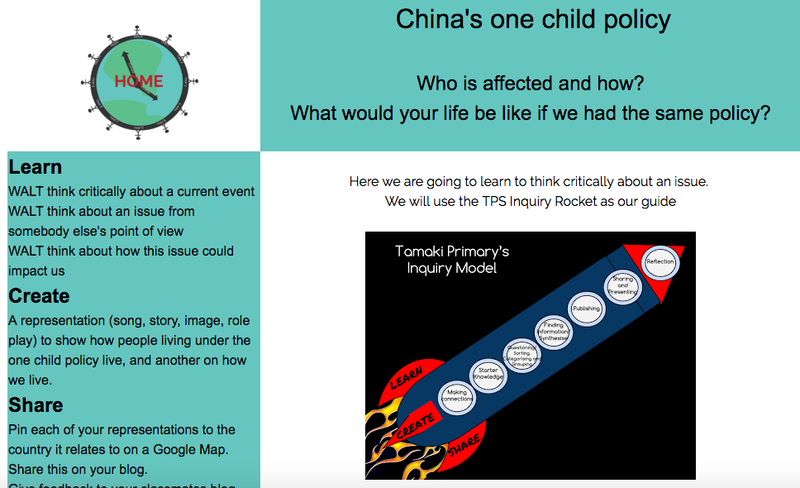 At a surface level, I have created my learning based around the changing of China's one child policy. Although this is not a current event in April 2016, I felt that it was an interesting enough of a story and had enough meaty content that I could relate to my learners, so I chose it anyway. 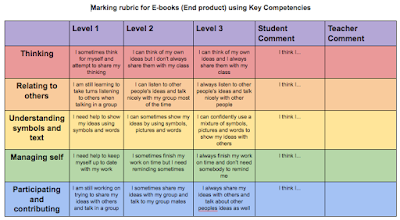 I have included a full weeks worth of planning, learning outcomes and success criteria, and all the resources you would need to complete this study down the bottom of the page. At a deeper level, unseen from the naked eye, is the cementing of my own knowledge by using HTML code to create this page. 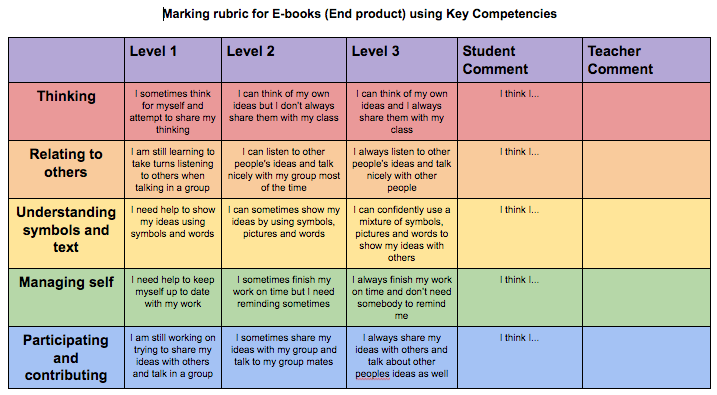 I also used tables to structure my content, and then had to revise how to make the borders invisible, change sizes of cells, merge cells, add rows, add colour to cells etc. 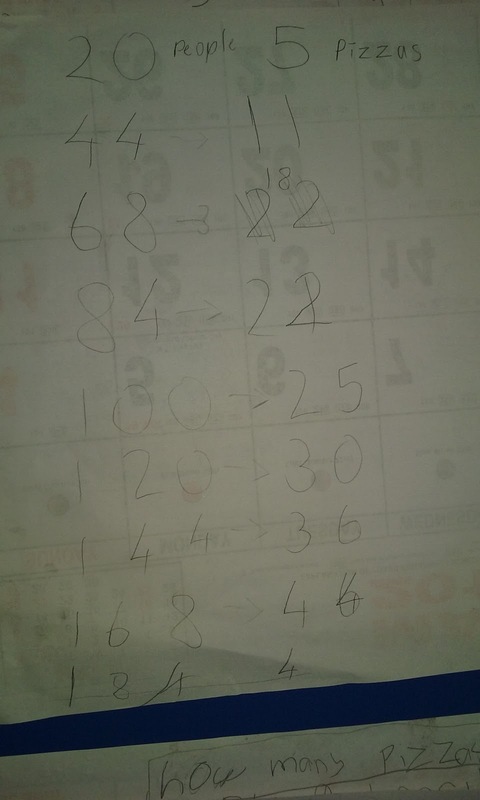 None of the formatting on that page is pre-made, I created it myself. I am quite proud of this site, as it not only cemented my own knowledge and challenged my HTML abilities, but is now a resource I can use in my school and class, and others can use as well.